Cyprus offers the diver warm, crystal clear, azure water with a rich and diverse variety of sea creatures, flora and fauna, all located in one of the most beautiful parts of the Mediterranean sea. The water hides treasures priceless to the diver, treasures far more valuable than gold or jewels…but who knows, maybe you will be lucky and find buried treasure hidden by ancient Greek sailors! The treasures of which we talk are the feelings and emotions felt by scuba divers during their dive…that’s far more precious than earthly wealth. On top of the natural beauty of Cyprus is the unorthodox collection of rarities which are so highly prized by divers. Rarities such as the “Zenobia”, an enormous sunken ferry, which according to experts is one of the best wrecks to dive in the world. To this day we can’t resolve the mystery of its loss, but what can be more challenging for adventurers than a secret? All we know is that the cargo vessel began to sink in “Larnaka” harbour, the report stated that the ship encountered technical problems but it has since been rumoured that the boat sank because of something more sinister. Fortunately no lives were lost during the accident so divers can explore the wreck without fear of disturbing anything other then the new residents, the abundant and colourful sea life. The “Zenobia” has become a mecca for wreck divers. She lies on her left side, allowing the novice diver to explore her right side in only 18 metres of water or if you are more experianced you can dive to her left side, to a depth of 42 metres. 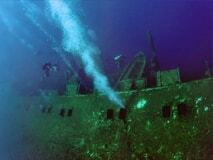 Thus the “Zenobia” is as interesting for beginners as for experienced wreck divers. The wreck is perfect for divers, they can access the cabins, restaurant and auxiliary rooms. Techno-dive enthusiasts can test their skill on three different levels of cargo deck; upper, middle and lower and since the “Zenobia” sunk with full holds, trucks litter the wreckage adding greater challenges for the diver to master. Only the most experienced dive to the lowest cargo deck and to engine room beyond. 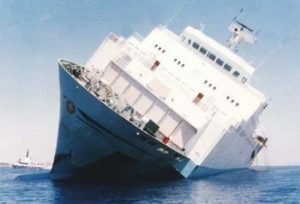 The ship is so big and the water is so transparent that it is possible to see the “Zenobia” from the surface, in fact if you fly over the wreck on your approach to Cyprus you will see it from your aircraft seat! The “Zenobia” is not the only treasure in the Cyprus treasure house. There is also the “Ahilles” and “Vera K”, well known wrecks off Paphos. The “Ahilles” lies 5 kilometres from Paphos harbour at a depth of 11 meters, lying on the seabed with her keel upwards, it is possible to dive under as well as around the boat, but be careful the wreck has some new residents, eels! Bits of wreckage from the “Ahilles” were thrown over a 300 meter radius from the boat as she sank, so the wreck takes up a large geographical area offering a great opportunity to discover the seabed around the site. Another popular wreck dive is not far from Paphos harbour, The “Vera K” was a Turkish registered cargo vessel that sank in a small hollow in the seabed, allowing the diver to combine wreck diving with the exploration of a reef and its dwellers. The Amphitheatre, Agius Georgius harbour, the romantically named Avdimou Wall with their caves…beginners as well as qualified divers cannot fail to be moved by the beauty of these places, the legends of Cyprus are waiting for you! Discover them with us!